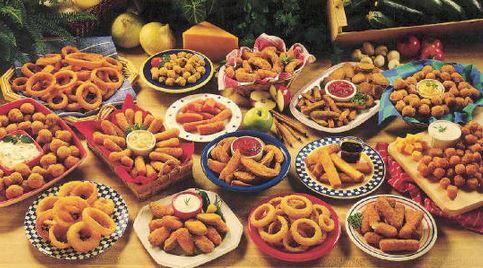 Fried food is at the top of most gastroenterologists’ worst food list because it is so difficult to digest. If you have the slightest digestive sensitivity, fried food can kick off a bout of heartburn and acid reflux. Some of the worst offenders are French fries, fatty steaks and deep-fried anything. The carbohydrates in refined foods — like chips, soda and white bread — move through your digestive system quickly, leading to symptoms like bloating, cramping and gas. The high fat and calorie content don’t do much for your weight and blood sugar levels either. You might enjoy the sweat they stir up, but spicy peppers can cause heartburn for hours after you eat them. Hot, spicy foods are particularly dangerous for your digestive system when you eat them close to bedtime or when you lay down. Yes, that sweet tooth you indulge is affecting more than the size of your thighs. Chocolate can trigger digestive symptoms like heartburn and upset stomach, especially if you have a disorder. For some people, it can even cause diarrhea and loose stools. While you think you’re doing your body a favor by shaving calories off your intake, your digestive system suffers when you substitute artificial sweeteners for natural sugar. The pink, yellow and blue packets are filled with ingredients that can cause bloating, diarrhea, and gas. It’s not technically a food unless you consider the three-martini lunch. Even drinking alcohol in moderation can relax the sphincter in your esophagus, causing heartburn or acid reflux. Too much alcohol can inflame your stomach lining, negatively affect your liver, or lead to diarrhea. It also can prevent you from absorbing nutrients properly. Too much of anything is bad for digestion, but corn in large amounts, because of its high cellulose content, can lead to significant gastrointestinal symptoms. Cellulose cannot be broken down by the human digestive tract. Corn passes through your system undigested; as such, it can cause cramps, abdominal pain, and gas in the process. Again, while it’s not a food, coffee definitely deserves a spot on this list. Coffee so irritates the stomach lining that nearly 40 million Americans have kicked the habit. Coffee can cause heartburn, acid reflux, and bowel habit– among other things. What’s in your mug? Just the name alone conjures up visions of acid reflux — and for good reason. Oranges, grapefruit, tomatoes and lemons are high in acid. Eating too much acidic fruit leads to the condition that carries its name. Eating these fruits on an empty stomach irritates your stomach lining even more. Even though you may know about the many health benefits of crunching raw veggies, you can expect to pay an intestinal price for over-indulging in the practice. Raw vegetables contain a lot of insoluble fiber that, like corn, can cause bloating, gas, diarrhea and cramps when they pass through your system undigested. Use caution when trying a new food. If you have a diagnosed digestive condition, pay attention to what you eat. Sufferers of GERD, colitis, Irritable Bowel Syndrome or Celiac disease, for example, already know to avoid fried and fatty foods. Book an appointment with your doctor if your symptoms last for more than a day. Getting a proper diagnosis is the first step to making healthier choices in the future. Contact NYC Gastroenterologist, Dr. Shawn Khodadadian, for more information on unhealthy foods for your digestive health. Learn about which foods are the best for your digestive system!